At St. Anne’s we value and enjoy music as a part of worship. Parishioners of all ages actively participate in our ministry of music—as members of our choirs, as instrumentalists, and in our congregational singing. 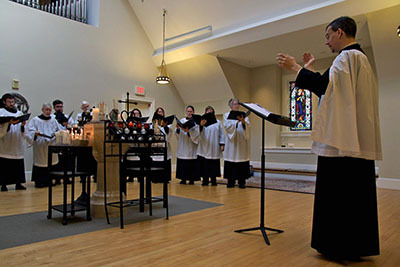 Led by Director of Music Jay Lane, our adult choir sings each Sunday at the 10 am Holy Eucharist, as well as at services such as Evensong, Lessons & Carols, and Holy Week. In addition, Jay leads our Youth Choir (grades 3-8), which sings occasionally throughout the year at our 10 am and 5 pm services. Professional singers and instrumentalists also enhance our worship throughout the year. To learn more, email Jay. Our volunteer choir, supported by four section leaders, meets Thursday evenings at 7:30 pm during the program year, and sings for the 10:00 am service on Sunday mornings. We especially enjoy music in the Anglican tradition; favorites from recent years include works by Stanford (Magnificat in B flat, Te deum in B flat), Bruckner (Christus factus est), Howells (Like as the hart) and many others, including Tallis and Byrd. We also sing for Lessons & Carols, Holy Week services, Evensongs, and occasional other services. Our choristers share a commitment to good music-making and creating a warm and friendly atmosphere. If you are interested in being a part of this group, all that is required is a love of singing and a willingness to make rehearsals a priority. Do you know about our “new” Children’s Choir? During the 2018-19 program year, all of the interested participants are in the 5-7 age bracket, so our music director is running this program on a different model more suitable for this age group. We meet most Sundays at 11:15 for about 15 minutes of games with music—lots of echo songs and learning by ear. (Think of it as “pre-choir”!) The choristers are learning musical skills, but with an emphasis on play. Do you know someone who might like this? If so, just bring them along to the choir room any Sunday. This group will someday sing in church—but right now it’s all about learning and having fun! Our annual Christmas Festival of Lessons and Carols features stories read by clergy and parishioners, anthems sung by the adult choir and youth choir, and hymns sung by everyone.